– Joe’s Question Corner: Can I Pay With My Paypal Account? Joe’s Question Corner: Can I Pay With My Paypal Account? Q: Can I use my Paypal account to pay for my order on CFS Binding Supplies? A: It’s a question we see quite often and now the answer is an absolute Yes! We have added a Paypal payment option to our checkout process to make it as flexible as we can to meet all of your needs. When checking out, just look for the Paypal tab next to the credit card options on the Shipping/Billing step. 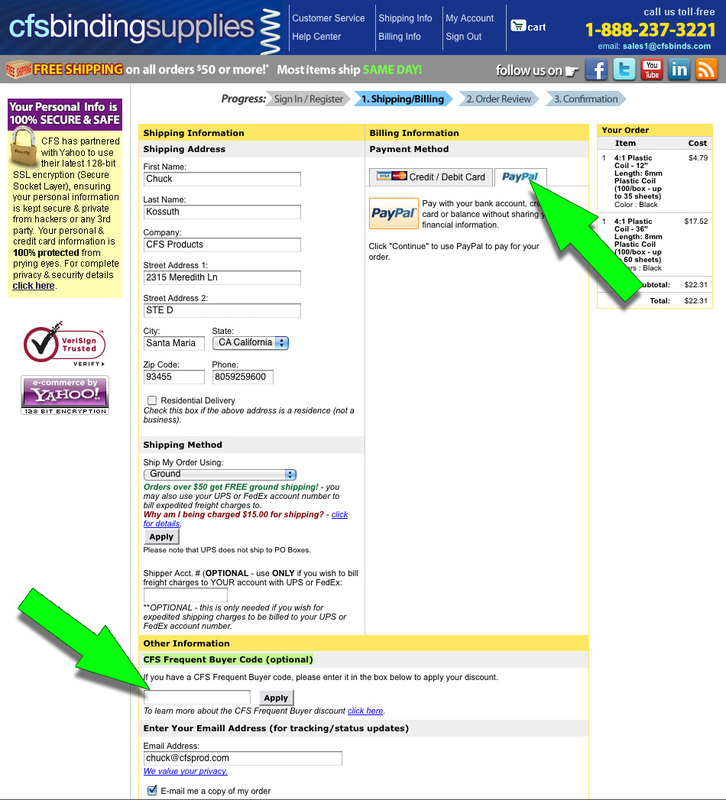 *IMPORTANT TIP: for returning customers – in order to apply your Frequent Buyer Discount code while using Paypal as your method of payment – please make sure that you scroll to the bottom of the Shipping/Billing page during checkout and enter your CFS Frequent Buyer Code in the field marked ‘CFS Frequent Buyer Code (optional)’ – click the image below for a larger view of this. Got a suggestion on how we can make our site easier to use? We’d love to read your comments below.